If you already have a great sewing machine then why not add a fabulous embroidery machine to your equipment? With the Brother Innov-IS you can explore the wonderful world of embroidery and create professional looking embellishments for your clothing, accessories and home furnishings. The outstanding Brother Innov-IS V3 features 227 Built-in embroidery designs so you have everything you need to produce amazing work as soon as you turn on the machine. There are also 17 fonts for monogramming to choose from and the built-in needle threader and quick set drop in bobbin mean that you are ready to start sewing in no time at all. You can rotate, re-size and mirror image your designs using the large LCD touchscreen. You have a great view of your work with the LED lighting and you can embroider at up to 1050 stitches per minute. When you are ready to explore more designs you can search online and then upload any patterns to the machine via the USB port. As if that isn’t enough, this machine is compatible with Brother’s PE-Design Plus software giving you amazing opportunities for creativity and enabling you to produce any pattern that you wish. 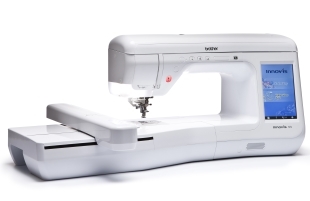 The Brother Innov-IS V3 features automatic thread tension and also thread sensors so you are warned if threads break or are about to run out. This is an advanced machine with a fabulous array of built-in designs that is sure to get your creative juices flowing.